Petrography is a fundamental part of the Earth Sciences, which plays a role in much of the research that takes place within the Earth Sciences department. It is also a core component of teaching at all levels of the within the undergraduate programme. 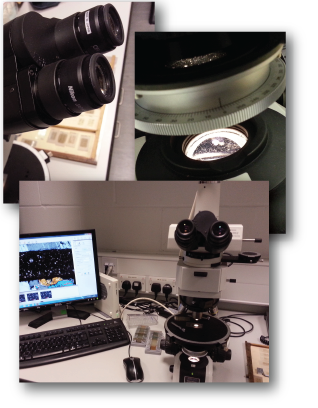 This page provides further information on the petrography and microscopy facilities in the Department of Earth Sciences, together with information on their use in its teaching and research. The Department of Earth Sciences has a dedicated Microscopy and SEM laboratory, which contains a significant proportion of our petrographic imaging equipment, and is used by researchers in almost all research areas. However, many research groups also have their own specialist equipment funded by grants and consortia. The GeoPOP3 Research Consortium will use the laboratory and especially the SEM for several of the research themes with 100% fEC funding. The Rock Mechanics Laboratory contains a state-of-the-art microscope purchased in 2013 for the analysis of rock deformation samples. The facility offers a full petrological service for industry with fast turn around times for SEM analysis of samples. We offer a unique facility in that samples need not be coated or polished to use the SEM-EDS and hence preserve sample integrity. Petrography is used in some capacity in a many research groups within the Earth Sciences department, as a tool for phase analysis, textural analysis, and quantitative analysis. This section explores the use of Petrography within these research groups. — identifying minerals/clasts within a rock as a hand specimen or in thin section. — examining the texture of a rock, the arrangement of the minerals/clasts within the sample. — e.g., grain size analysis, image analyses, point counting. The Structural Research Group at Durham make extensive use of the microscopy facilities across all three areas. Investigation of rock texture at the outcrop, hand specimen and thin section scale yeild information on the deformational history of a region that is of interest within Structural Research. In addition, the closely associated Rock Mechanics Laboratory uses petrography to examine samples produced using the LVHRS apparatus, in order to understand the mechanisms of faulting within the crust. Petrographic analysis in Sedimentological research is mainly used to provide estimates of the pore space, composition, and paragenesis of a sample. Image analysis for quantitative estimates of the pore space within a sample,for example, contribute to estimates of reservoir potential and fluid overpressure. Micropalaeontological research is undertaken largely through the use of microscopes, both reflected light and transmitted light. 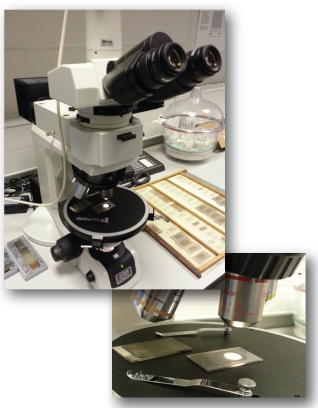 At Durham, the Palaeoecosystems group uses the Microscope suite as well as the table-top SEM. In addition, the group have dedicated microscopes in the palaeoecosystems laboratory located on Level 1 in the Arthur Holmes Building. The Earth Sciences department offers a range of taught undergraduate degree programmes. Petrology and petrography form core components throught these but significantly at Level 1 and Level 2. The Level 1 Earth Materials module teaches students the principles of crystallography and petrology along with the basic methods to identify minerals in hand specimen or under a petrographic microscope. These skills are then applied further in Level 2 and 3 modules to develop student understanding of the physical processes that shape the Earth.